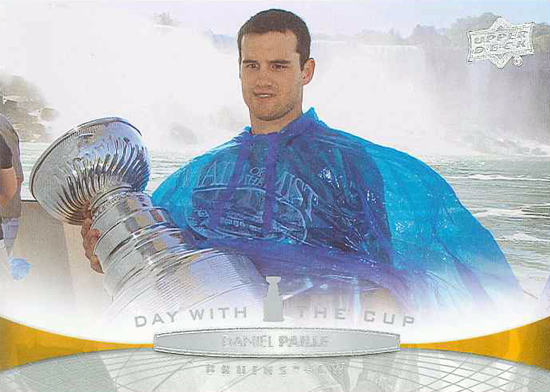 Question Answered: What is the “Day with the Cup” insert found in 2011-12 NHL Upper Deck all about? We love to surprise collectors from time to time by including unannounced inserts in some of our flagship products. 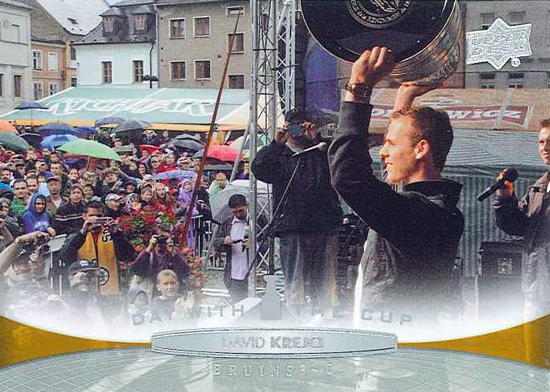 That was the strategy with the 2011-12 NHL Upper Deck “Day with the Cup” insert set that has been a hotbed of discussion on various trading card message boards. Now with the product heavily broken, we felt it was time to reveal more information about this insert set. 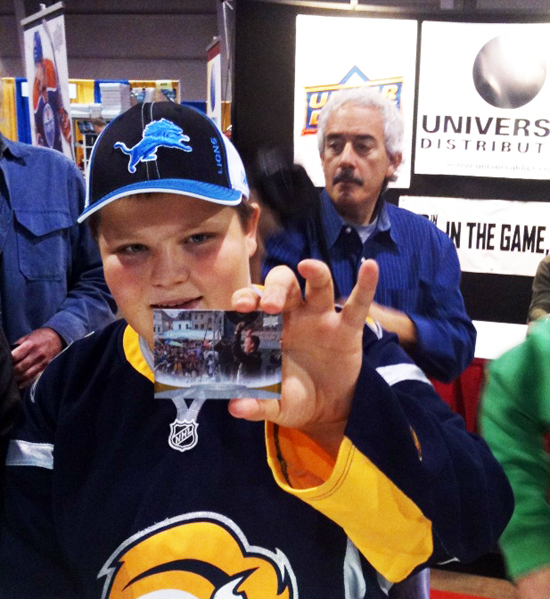 This lucky collector shows off his "Day with the Cup" pull at the Sports Cards & Collectibles Expo from last weekend. 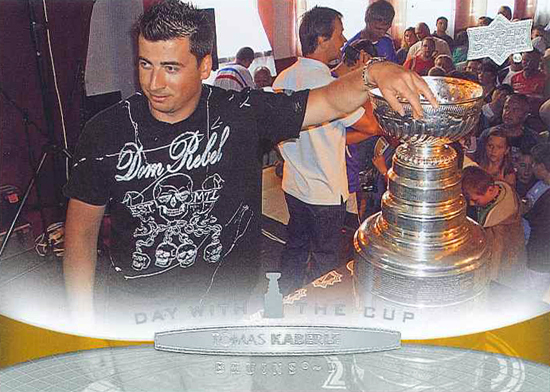 The whole idea for the “Day with the Cup” insert set came shortly after the Chicago Blackhawks won the championship in 2010. 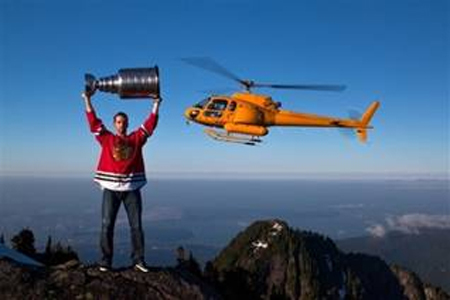 A particularly striking image of Andrew Ladd pictured hoisting the Stanley Cup above his head at the top of the Crown Mountain in his native British Columbia with a helicopter hovering in the background made its way across the internet. 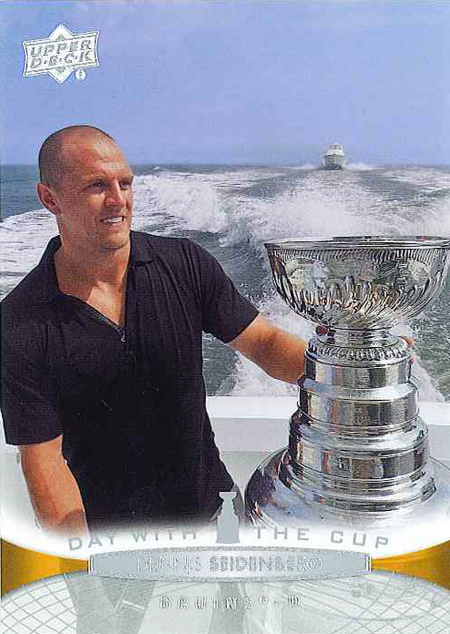 It made us realize that unique images of athletes enjoying their “Day with the Cup” would be a great match for the Upper Deck brand that is so well known for striking photography. This is the image that started our thinking this could be a really fun insert set. 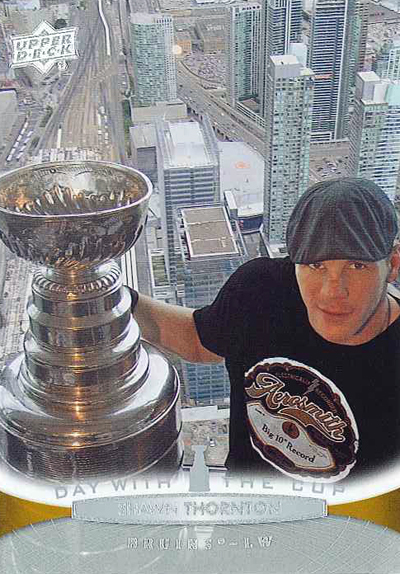 Further more the Hockey Hall-of-Fame had been (and still is) keeping an amazing archive of the Stanley Cup’s annual summer tour on their website in an area called the “Stanley Cup Journal” with information and photos dating back to 2003. Realizing this was a set we were destined to do, our product development and brand teams for hockey presented the idea to the league and the Hockey Hall-of-Fame. We had the very good fortune of being able to partner up with Phil Pritchard, the Vice President Curator of the Hockey Hall-of-Fame, more famously known to hockey aficionados as the “Keeper of the Cup.” Each summer Pritchard and his staff travel across countries and continents chronicling each player’s “Day with the Cup” as it makes its way across the roster of that season’s championship team. 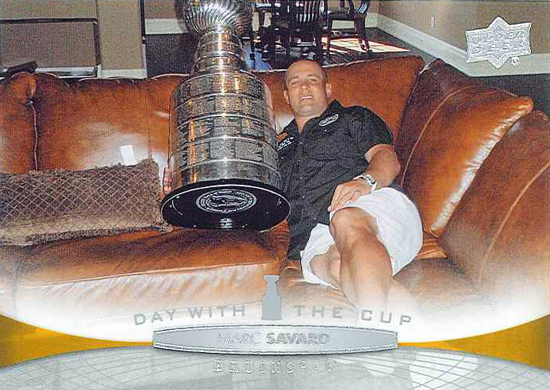 All of the photos (highlighted by unique images on the front and back) and the text on the back of UD’s “Day with the Cup” cards was provided by Pritchard and his staff. The checklist for the set was comprised with the intent of presenting the cards in chronological order based on the dates that each player spent with the Stanley Cup. 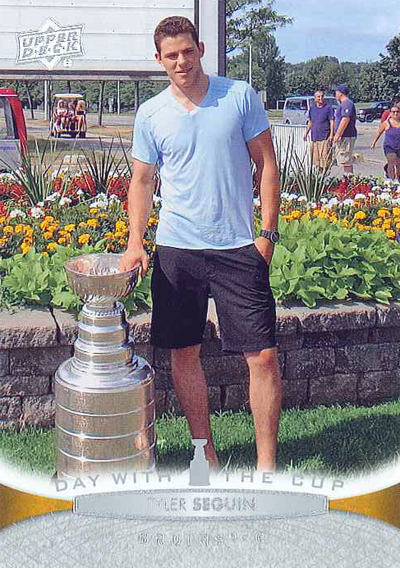 Nathan Horton is card #DC1 because he was the first member of the Boston Bruins to enjoy a “Day with the Cup” on July 17, 2011. 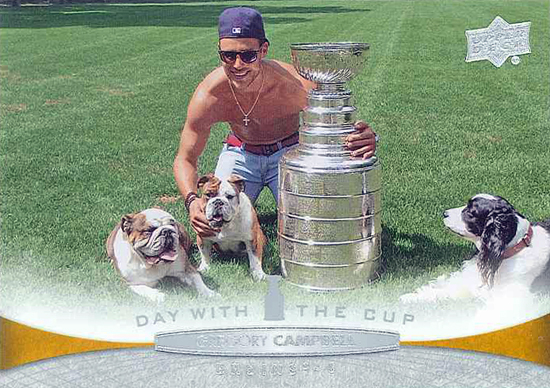 For the rich array of options presented to the hockey card collectors throughout the years, there has never been a set, or insert set for that matter, based upon the story of the Stanley Cup as it makes its annual summer vacation across the world. We through we had the unique opportunity in front of us to provide Bruins collectors (as well as fans of the Upper Deck set) with a set of cards to collect that provides a rare glimpse into the final chapter of the Boston Bruins 2010-11 championship season. And speaking of rare, that is exactly what these cards are. Seeding odds for the Series One “Day with the Cup” insert set are as follows; 1:1000 hobby packs, 1:2500 retail packs and 1:5000 blaster packs. 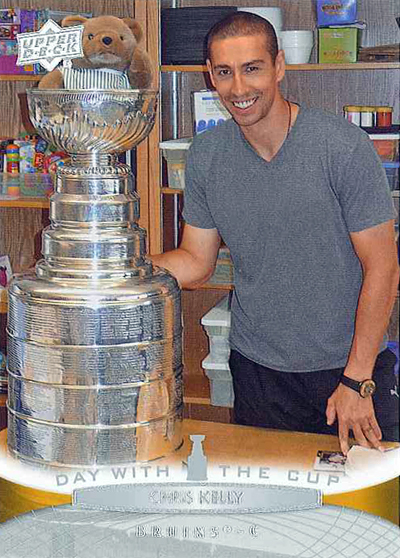 Our hockey team hustled to get the needed approvals from the league offices along with last-minute printing on the cards that allowed us to capture fourteen Bruins enjoying their “Day with the Cup” in 2011-12 NHL Upper Deck Series One packs. The remaining players will be featured in 2011-12 NHL Upper Deck Series Two. Upper Deck once again proves they are the only company making cards that is truly connected to the collector! What an awesome idea and insert. 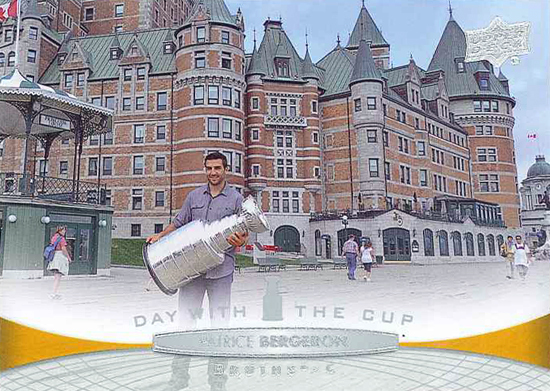 I love the fact that Patrice Bergeron’s standing there with the Cup and no one’s paying any attention to him. I’ve been in that exact, and I bet everyone was over buying beaver tails from the stand behind him. Way cool–hope to pull a few as keepers. 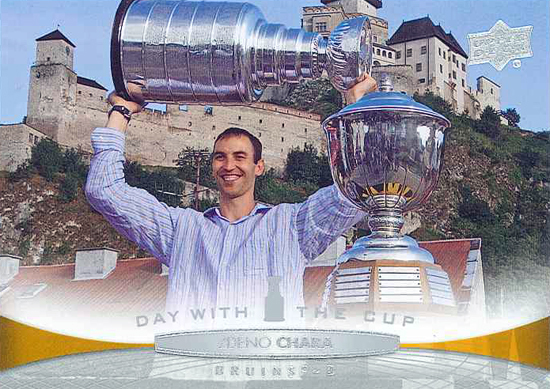 Chara’s picture is not from Bratislava, it is from Trencin, Slovakia. WHERE IS THE BRAD MARCHAND ONE?!?!? !